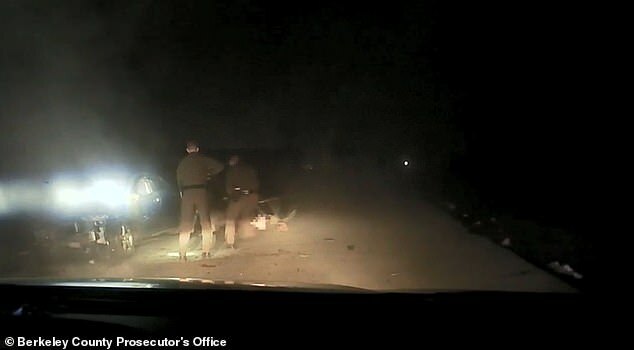 Disturbing dashcam footage shows West Virginia police officers beating a 16-year-old boy after he crashed his car while fleeing the scene of an accident last fall. 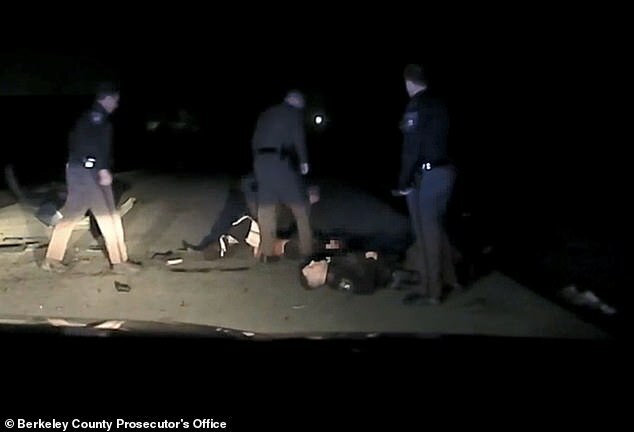 Berkeley County Prosecutor Catie Wilkes Delligatti on Thursday released an eight-minute video of the incident that ultimately led to the firing of two state troopers and two sheriff's deputies in January, according to The Associated Press. 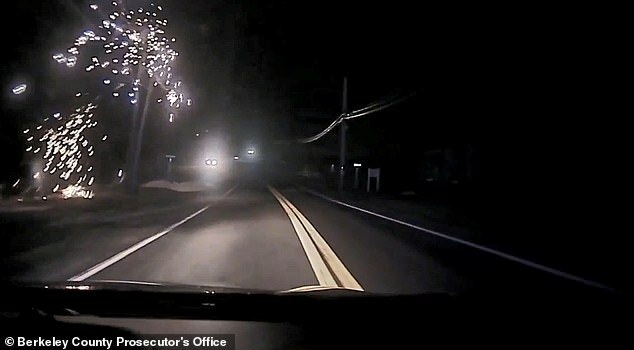 The footage from the night of November 19, 2018, shows the teen's car speeding down a road seconds before he loses control and crashes into a telephone pole. Four officers approach the wrecked vehicle and pull the driver out of the window, flinging him onto the ground several feet away. A struggle ensues as the cops take turns punching and kicking the boy, one of them striking him at least seven times. They also toss him in the air multiple times in an apparent attempt to get him where the dashcam won't be able to see what they're doing. The teen has not been identified and his face was redacted in the clip. The pursuit that preceded the crash reportedly began after the teen rear-ended the cruiser Merson was driving. The boy sustained non-life-threatening injuries during the violent arrest and was taken to a hospital for observation. He was released from police custody and it remains unclear whether he faced any charges. 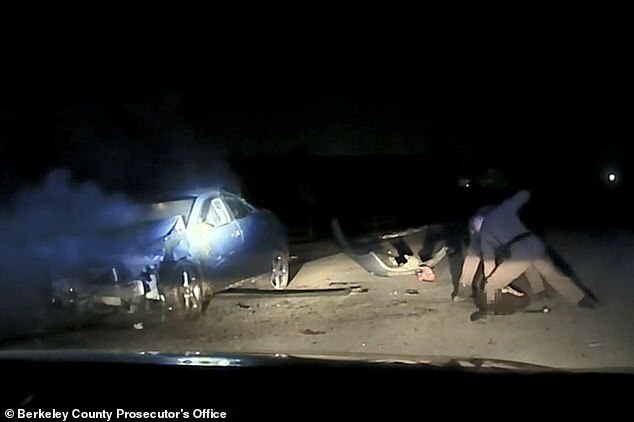 They fling him on the ground several feet from the car before a struggle ensues Authorities originally denied media requests for the video because the investigation was ongoing. It was finally released this week after one of the troopers, 29-year-old Michael Kennedy, was indicted Wednesday by a federal grand jury for using excessive force that resulted in bodily injury. He faces up to 10 years in prison and a $250,000 maximum fine if convicted on one count of deprivation of rights under color of law - language used to describe crimes committed by police officers while on duty. West Virginia State Police announced in January that Kennedy and Trooper First Class Derek Walker had been discharged from the Martinsburg detachment. Two Berkeley County deputies, Austin Ennis and Chris Merson, were also fired. Ennis was rehired last week. The FBI is investigating the incident, along with the Jefferson County Sheriff's Office and the Berkeley County Prosecutor's Office. West Virginia Gov Jim Justice previously condemned the troopers' actions in the video.